As you start the process of looking for your new home, you know thorough research is the best way to find the right builder for you. You want a company that’s going to meet all of your needs and treat you with the respect you deserve. Realistically, a home is the biggest investment most of us will ever make. So, when making this large decision, you want to be sure you’re asking the right questions - especially when you're touring show homes and speaking to area sales managers. Do You Have Any Homes Available Now? Which Model is Most Popular and Why? What Comes Standard with the Home? Am I Able to Make Changes to Upgrades During Construction? Is The Home Energy Efficient? What Promotions Are Available And How Do I Benefit From Them? Which Mortgage Brokers Do You Use? Do I Have to Use Them Too? How Will You Keep Me Updated on My Home’s Progress? What Does the Warranty Include? Is There Any Support After I Move In? As you visit show homes, it’s important to take a list of questions you want to ask a builder. The Area Manager should be able to answer these questions and help you get a better sense of what it will be like to work with them. But exactly what questions should you be asking? We’ve put together a list of some of the best questions to ask an Area Manager. 1. How Long Will It Take To Build My Home? Knowing the approximate build time of your new home is quite important. You’ll want to know how long the process will take from start to finish so you can time the move to fit with your schedule. Also, if you need to sell your current home, this will provide you with a desired closing date. If you’re renting this will allow you to budget how many more months you’ll need to pay for, and to find a new tenant to sublet if necessary. For instance, you usually start out by choosing a floor plan and a lot for the home, but you may still have several months before you need to make design decisions. Many builders also have a deadline for any changes. Once that date passes, you won’t be able to make adjustments. While timelines aren't completely set-in-stone (delays happen! ), an experienced builder should be able to give you a general idea. 2. Do You Have Any Homes Available Now? Depending on the builder you choose, they may already have homes constructed and ready for purchase. There are many advantages to purchasing a move-in ready home and builders usually have a wide selection to choose from. For this reason, they're a great option if you're wanting to move in quickly. One great benefit of a quick possession home, aside from the shortened time to move in, is that these homes are based on popular models and the latest trends. This means you're sure to have a new home with the finishes you want. 3. Which Model is Most Popular and Why? Depending on which builder you visit, it’s likely that, for you, there are a few models that stand out among the others. While it's good to take note of the most popular models, don’t let it sway your decision too much. If there is another model you like more which will fulfil your needs, trust your first instinct. If you’ve fallen in love with a particular floor plan, ask the Area Manager which communities will allow that design. If you love a particular community, you may need to start by asking which styles of homes are available there. Most builders have a version of each floor plan somewhere in Edmonton. You can travel to look at the show home even if it’s not in your ideal neighbourhood. 4. What Comes Standard with the Home? What kind of finishes and fixtures will it include? Will there be marble countertops in the kitchen? What kind of flooring would there be? If you know what comes standard with the home, you’ll know what upgrades you’d need to make the home the way you want it. The other thing to take into account is the exterior. Initial estimates for a new home don’t always include things like landscaping or a fence. If you don’t factor these costs into the equation, you’ll be overestimating how much home you can afford. It’s important to figure out what your final cost is going to be. When the Area Manager shows you an estimated price of the home you want, you need to ask for a detailed list of what that includes and what other expenses to expect when buying a new home. 5. What Upgrades Are Available? Now that you know what is standard, it’s important to find out about the extras your builder can include. Upgrades are the extra fixtures or finishes that can be incorporated into your home; this is usually at an additional cost. These can be anything from faucets and flooring to countertops or a developed basement. If there are special things you want in your home, ask! That feature might be available in a different floor plan or the builder might be able to include it with your build, even if it isn’t part of their usual design. Of course, these types of changes typically come with a charge. You may need to pay extra for a specific material, and you may even need to pay for an architect to incorporate the changes into your home’s design. This should help you decide if you should opt for builder upgrades now or make changes later. Once you see the cost, you may change your mind. As you compare home builders and narrow down your search, it’s really important to also compare prices on the upgrades you want. While one home may be less expensive, that builder may charge more for upgrades, meaning you won’t reap as much in savings as you first thought. When you walk into a show home, you typically see a sign or flyer stating this style of home has a certain starting price. However, you know the price increases with upgrades, so the show home you love can really be more than the price of the base model. The Area Manager will be able to tell you which features in the show home are standard and which are upgrades. Be sure to also ask to see show homes that use the standard materials so you see what they look like in action. 6. Am I Able to Make Changes to Upgrades During Construction? Home builders understand you may have a change of heart about the upgrades you’ve asked for and want to revise them. Ask the sales manager whether you can make changes to your upgrades during construction and whether there will be any associated costs. Something you need to keep in mind when it comes to changes is that every item you change adds time to your build, and it can add to the cost as well. Your best bet is to make sure you get everything locked in as early as possible. 7. Is The Home Energy Efficient? If a home isn’t energy efficient, any savings you received in the purchase of the home will evaporate once you start living in it. Ask whether the home is built with this in mind, specifically when it comes to important components such as the HVAC system, windows and doors. You also want to check about the appliance options you have and what the energy efficiency rating is on them. Life happens, and unfortunately not always with the most positive results. Whether it’s because of a job loss or other situation that has arisen, it may be in your best interest to cancel your agreement to build a house. Each builder operates in a different way, so be sure you know whether you’ll be able to cancel and, more importantly, when you won’t be able to. 9. What Promotions Are Available And How Do I Benefit From Them? Most builders will have one promotion or another going on most of the year. Ask the sales manager which ones are going on currently, as well as whether there will be other promotions coming up. The best builder promotions will depend largely on your wants and needs for your new home. When choosing a promotion, be sure to pick the one that best serves your interests. 10. How Does Financing Work? Financing for new construction is slightly different from financing a resale home. You'll choose from two different types of mortgages: a completion or a draw mortgage. A completion mortgage is quite similar to a traditional mortgage and comes into effect once the home is completed. A draw mortgage comes into effect once the paperwork is signed and construction starts on your new home. Both have their own set of pros and cons. You do need to find out when you need to make your down payment and get a sense of how much you might need to bring on closing day. Of course, a lender can better answer most of the finance questions, but the Area Manager can put you on the right track. 11. Which Mortgage Brokers Do You Use? Do I Have to Use Them Too? This question is especially helpful if you're a first-time homebuyer. The builder you work with is a wealth of information on the process, including whom to seek out regarding a mortgage. They will know which mortgage brokers their past customers have been happy with and might even have one they prefer to deal with. Asking this question will ensure you add some more resources to your home buying toolkit. 12. How Will You Keep Me Updated on My Home’s Progress? Once you’ve made this big investment, you'll want to keep an eye on it! Builders all have different ways of keeping their customers informed on their home’s progress. Knowing what to expect in this regard will help you avoid the urge to drive by your future home every day checking out the progress on your own. 13. What Communities Are Available? The community you build in is just as important as the home you buy. Find a community that has the features and amenities your family needs and wants. Keep in mind, community guidelines often have restrictions with regard to the style of the homes. For instance, you can’t build a modern-looking home in a community with a focus on classic architecture. 14. What Does the Warranty Include? Is There Any Support After I Move In? 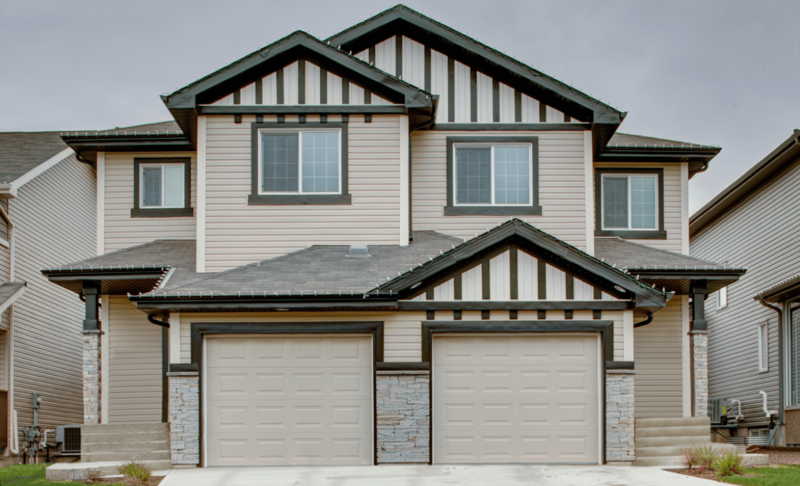 All new homes come with new home warranties in Alberta, but you should ask about what your new warranty will cover. Learn more about what your responsibilities are in keeping the warranty valid. You’ll also feel better if you know the builder has a process for addressing customer complaints soon after moving in. 15. What Do I Need to Get Started? Once you’ve found a builder you like, it’s time to ask the Area Manager what you’ll need to do to get started with the buying process. This may require a mortgage pre-approval, a down payment, and/or scheduling a meeting to go over the paperwork. Each builder has a slightly different process. Beyond Area Managers, consider other people you'll absolutely need help from when buying a new home to make the process as easy as possible for you. Asking the right questions will help you choose a great Edmonton home builder. Of course, these questions are simply a starting point when meeting choose a great Edmonton home builder with a home builder’s sales manager. However, by asking these questions right from the start, you'll be well-positioned for a positive home buying journey. And please feel free to add any of your own questions to our list! Originally posted Nov 11, 2016, updated Mar 29, 2019.